High stakes gambler Bob Stupak was notably the best friend of former Horseshoe owners Jack and Ted Binion. Stupak is still often shown in reruns on national television at the Horseshoe Club gambling during the Binion's proprietorship. The Binions ran the club until the unfriendly takeover by their estranged sister Becky and her husband Nick Behnen in June 1998. Bob Stupak and a number of other high rollers stopped gambling at the Horseshoe after the Behnens arrived on the scene. The Behnens have not been as successful in running the casino as their brothers. Since their arrival, the casino has been plagued with financial troubles. The dismantling of the glass display of one million dollars in cash is sited as an example of how winnings have leveled off for the Behnens. The abyss between Becky and Jack has also reportedly grown since the takeover and Ted's untimely death. Becky was recently shown on TV "mourning" at her brother Ted's grave. Some viewers thought the news cameras coincidentally showing up just when she decided to visit the grave was indication that the event was staged - especially with the speculation about the hostility between the siblings. 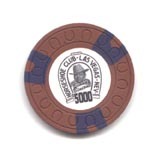 One day in November 1998, following Ted's death, his close friend Bob Stupak entered the Horseshoe Club and tried to cash $250,000 worth of $5,000 chips. Stupak also attempted to retrieve two safe deposit boxes full of cash he had on deposit in the casino's cage. Becky and Nick unexplainably refused to cash Stupak's chips or return his currency. Stupak loudly protested and was thrown out by Becky and Nick's 23 year old son Benny. 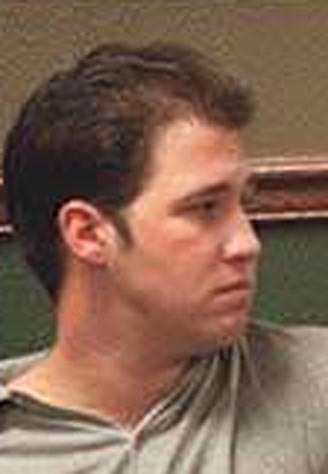 Stupak filed a police report saying Benny took a swing at him during the episode. Stupak had over $300,000 in one hundred dollar bills stored in the Horseshoe's casino cage at the time - not that unusual for a regular high stakes player. The Behnens obviously had no intention of returning Bob's money! Nick Behnen is not licensed as an employee of the Horseshoe and is not entitled to exercise authority in the casino, though Nick was identified as the person who made the decision to throw Stupak out that morning and keep his two boxes of money. Bob Stupak really needed help. He called my home later that day. The week of this occurrence, the National Gambling Impact Study Commission was in town and the eyes of the nation were on the hearings at the MGM. Also in town was nationally known gambling critic the Reverend Tom Grey, Executive Director of the National Coalition Against Gambling Expansion. Rev. Grey was my house guest. Stupak invited Rev. Grey and I to meet him for dinner after the Study Commission hearings. After dinner, Stupak donated one of his then-uncashable $5,000 "chocolate chips" to Grey's Methodist church in Illinois. Grey accepted the chip referring to it as "the coin of the realm." The rest is local history. By donating the chip to Grey's church, Stupak showed his hand. He knew that Nick and Becky Behnen were soon to meet their match in the Reverend Thomas Grey! He also knew that Grey would not waste such a generous donation to his church's inner-city youth group. Rev. Grey had just been featured on CBS Sixty Minutes and is a close friend of several syndicated journalists including New York Times columnist William Safire. Grey is also a critic of Nevada Gaming Regulations, the Nevada Gaming Commission, and its' Chairman Bill Bible who was a Gambling Impact Study Commissioner. Rev. Grey and I were especially interested in embarrassing Bible for his encouraging casino expansion outside Nevada. Stupak's uncashable chip was our perfect justification! Rev. Grey and I left the meeting with Stupak at 10 PM and drove directly to the Horseshoe. We went to the casino cage where Grey presented the chip for redemption. A manager was called over and he told Rev. Grey that only a man by the name of Mr. Perkins had the authority to cash a $5,000 chip and that he had gone home for the night. We were asked to return in the morning when Mr. Perkins was on duty. The following day Rev. Grey had a plane to catch so we returned to the Horseshoe early. The Reverend asked for Mr. Perkins. An elderly man stepped forward and immediately ordered us to leave the casino. He summoned security guards while shouting at Rev. Grey and myself. We exited without protest. Rev. Grey gave me possession of the $5,000 chip and asked me to send his church a check when and if I could get it cashed. I felt compelled to succeed for the sake of Rev. Grey's prized inner-city youth group that he described as desperately needing the funds. Later that day I informed Bob Stupak of our rude treatment at the Horseshoe. He was not surprised and had alternative plans. Meanwhile, Rev. Grey contacted the national media and the story began to spread. "Nevada casino refuses to honor its own chips." I returned to the MGM for the last day of the Gambling Impact Study Commission hearings. I relayed the story of Rev. Grey's oppressive treatment at the Horseshoe to anyone who cared to listen, especially reporters. I showed everyone Grey's uncashable $5,000 Horseshoe chip to prove my point. The chip caper became a major news story. Bob Stupak ask me to meet him at 3 PM in front of the Horseshoe. I couldn't wait to see what he had in mind! When I arrived with the chip, Bob, his attorney, two Nevada Gaming Control agents, and a plethora of reporters greeted me. Against the orders of Horseshoe security officers, we entered the casino. I walked up to the cage and politely requested that they cash the chip. Becky and Nick Behnen were present and ordered the cashiers to ignore my request. I persisted as the TV cameras rolled. The standoff continued. Then, to my delight, the two Gaming Control agents showed their badges and ordered the Behnens to cash my chip. Becky gave no reason and continued to refuse to make the redemption. Then the agents ordered Behnen to bring Stupak's cash boxes to the counter. She complied and had the two boxes brought out. I stood by while cashiers hand counted the first $300,000.00 in one hundred dollar bills. I stopped monitoring while they continued counting for another half-hour. Stupak shoved the cash into several plastic "Fabulous Las Vegas" shopping bags purchased at the gift shop. I asked the Gaming Control agents what they were intending to do now since the Behnens were still refusing to cash my chip. They replied that they had to speak to their superiors. I commented that if this had happened at Stupak's old Vegas World Casino, they would have put a padlock on the door! The Behnens obviously had more clout than Stupak that day. That was the day that I was also eighty-sixed permanently from the Horseshoe. No big loss for me since I'm not a gambler and hadn't been in the place for at least ten years. Stupak and his attorney left the Horseshoe and carried the bags of cash across the street to deposit the money in the cage of the Golden Nugget where Bob was still welcome. Not yet ready to give up and let Bill Bible and the Gaming Control Board do our bidding, Bob and I had more tricks up our sleeve for Nick and Becky. We drove back to Stupak's attorney's office where I filed a lawsuit against the Behnens and the Horseshoe Club on behalf of Reverend Grey and myself. STEVE MILLER and REVEREND THOMAS GREY vs. THE HORSESHOE CLUB spelled out the Behnen's clear violation of Nevada Gaming laws. The briefs from the lawsuit were immediately shared with gaming authorities in Carson City, and the National Gambling Impact Study Commission. Carson City promptly started an intense investigation. The Behnens soon groveled. We decided to let the gaming officials handle the problem and dismissed the lawsuit. However, Bob and I were not yet through with the people who eighty-sixed us from their casino. Just as we expected, the Behnens were bringing embarrassment upon their own industry. To put a spotlight on them, Bob called me the next day and again requested we meet in front of the Horseshoe at 3 PM. I rushed downtown to see what he had planned this time. In addition to the now familiar assemblage of reporters and cameras, the entire UNLV football team surrounded Bob! He had hired thirty muscle-bound college guys to accompany us back into the Horseshoe. We marched past protesting security guards and once again headed directly to the casino cage. I politely presented my "chocolate chip" and was immediately refused. This time though something very unusual happened right in front of the news cameras. A big, mean looking guy in a fancy suit yelled at me. "Hey Miller, I know who you are and this is no joke! I want to see you in my office right now!" Having heard the legends about what has happened to other hapless individuals who had the misfortune to be "invited" into the "office" at the Horseshoe, I could find no words to express my emotion. I began laughing. This made the big guy furious! Even the observers showed empathy for the situation. Everybody remembered those news stories about people being beat up in the "office" at the Horseshoe. Not being prepared for my natural reaction to being invited into the "office," Bob decided to lead his entourage outside. I knew this would be my last visit to the friendly Horseshoe and I really did not want to go so soon, but Bob insisted. Later that day, an old friend who has worked at the Horseshoe for over thirty years met with me. He told me his version of what was happening. It made a lot of sense. He said that on the days that Ted and Jack were vacating the casino, both brothers had gone into the casino cage and emptied the racks of "chocolate chips." He stated that when Ted left in 1996, and when Jack left in 1998, they were still the owners at the time and had every right to take the chips. He then told me that the brothers were planning to cash the chips all at once to break the bank and take back the hotel at a time in the future when they anticipated Becky and Nick Behnen would fail the business. Jack and Ted were supposedly just waiting for the Behnens to have a dry spell and deplete the reserves enough to not be able to cash the chips all at once, a serious violation of state law. He then said that Ted had "taken care" of former Vegas Mayor Jan Jones when she was running for Governor so that Ted, with her help, would get his gaming license reinstated so he and his brother could force their sister and brother in law out. Since Ted's death, Binion's Horseshoe has been bleeding red ink and there's no sign of improvement. Becky Binion Behnen has been forced to plow millions in personal funds into Horseshoe accounts to keep the failing property open, while the list of Horseshoe business associates owed money continues to grow. A National Labor Relations Board complaint has been filed accusing the casino of being behind on contractually promised payments to the Culinary's health and welfare plan. Other problems include the casino being $2.5 million behind on payments to the Fremont Street Experience pedestrian mall, and being in arrears on lease payments owed to property landlords. State gaming regulators in October forced the downtown casino to shut down hundreds of slot machines as well as several table games and its keno operation when the Horseshoe's bankroll dropped below the state's minimum requirements. It was expected that Jack and Ted's closest friends would present the chips all at once. The "test" would be if I could get the chip in my possession cashed. If so, then all the chips would arrive on a selected day soon thereafter, the bank would be broken, and Jack and Ted would take the club back. Unfortunately, Ted was gone and Jack had little ambition to take back the Horseshoe without him, though it was speculated that he would take the property back if Bob Stupak would agree to manage the casino. It remains to be seen what role Stupak will play if Binion recovers the Horseshoe. Ted was paranoid about his safety during the weeks leading up to his death and asked old friends to stay close to him day and night. He also stated that someone had broken all of the lenses on the eight security cameras surrounding his house on the evening before his death therefore the cameras could not show incriminating activity. Ted died the day following Jones' visit to his house to pick up her $40,000 campaign contribution. Jones later lost the gubernatorial election. Reverend Grey's chip was cashed twelve months later in July 1999, one day before the Gaming Commission was to hold a public hearing on the Behnen's refusal to cash the chips. Rev. Grey's church received a check for $5,000 the following day. The Behnens have since found the the money to cash all of the remaining "chocolate chips." A retrial of Sandy Murphy and Rick Tabish, the accused murderers of Ted Binion, is being considered by the Nevada Supreme Court. Meanwhile, Horseshoe Gaming Holding Corp. just announced that it will relocate its corporate office to Las Vegas from suburban Chicago. The company owned by Jack Binion is the largest privately held gaming company in the United States; it operates Horseshoe casinos in Bossier City, La. ; Hammond, Ind., and Tunica, Miss. Gaming observers believe that Jack Binion is relocating to be near the Las Vegas Horseshoe in the probable event it closes. If that occurs, he will be in line to take it back and continue operations since he is still named on the casino's gaming license. However, those close to him say that without his brother by his side, he is not anxious for that to occur. Last year, FBI documents surfaced that indicate the bureau once considered the possibility that people other than Murphy and Tabish could have been involved in the slaying of Ted Binion. An incident in 1996 attracted police attention when Benny Behnen was linked to a drive-by shooting outside Ted Binion's Palomino Lane home, the same house in which Binion was found dead Sept. 17, 1998. 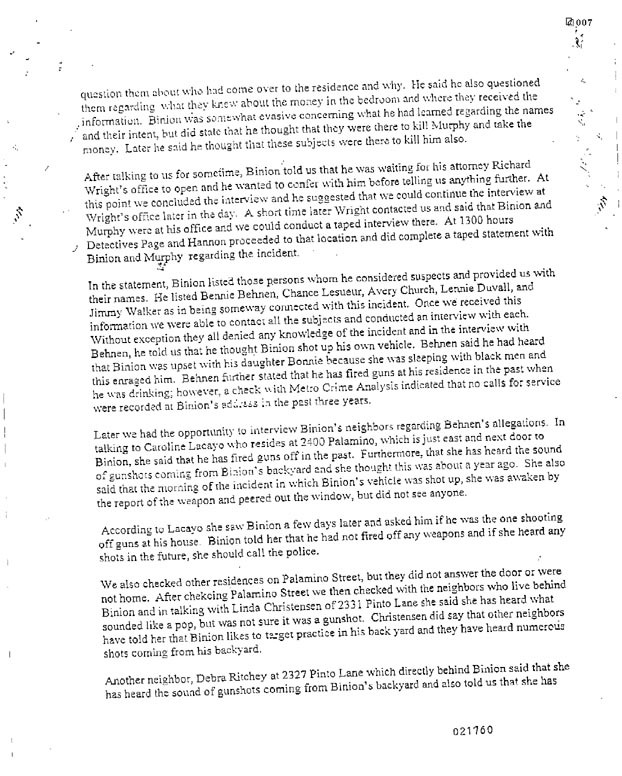 Though Binion named his nephew in a police report, he was not charged. A friend of Benny Behnen, Grover LeSueur, although initially charged with attempted murder, eventually pleaded guilty to lesser charges. Several years later, LeSueur, then 23, was found dead of unknown causes in Phoenix, Arizona.